Stratosphere Casino, Hotel & Tower is proud to announce that they have won an unprecedented 30 Las Vegas Review-Journal 2017 Best of Las Vegas Awards – the most of any single property on the Las Vegas Strip. The prestigious annual competition hosted by the Review-Journal, based upon readers’ votes, awards winners across a wide variety of categories. Top of the World: Fine Dining, View, Power Lunch, Romantic Spot, Date Night Spot. 107 SkyLounge: Cocktail Bar, Happy Hour, Martini, Specialty Cocktails, Late Night Eats. Stratosphere Casino, Hotel & Tower: Hotel View, Strip Hotel, Staycation, Sports Book, Strip Slots, Strip Table Games, Valet, Shrimp Cocktail. ace l PLAY: Player’s/Loyalty Club. Roxy’s Diner: Breakfast, Burger, Coffee Shop & Diner. Chapel in the Clouds: Wedding Chapel. Stratosphere Casino, Hotel & Tower: Paying Slots. Top of the World: Steakhouse. McCall’s Heartland Grill: Casual Restaurant. Stratosphere Casino, Hotel & Tower: Video Poker. In addition to Stratosphere’s 30 awards, two independently produced shows at Stratosphere were also award winners. L.A. Comedy Club won Silver for Best Comedy Club and MJ LIVE won Silver for Best Impersonator. For more information, or to book your stay at Stratosphere, call 800.99.TOWER or visit StratosphereHotel.com. 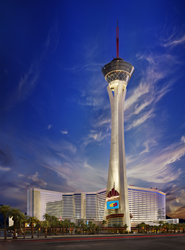 Stratosphere is a subsidiary of Las Vegas-based Golden Entertainment, Inc.
About Stratosphere Casino, Hotel & Tower: About Stratosphere Casino, Hotel & Tower: Stratosphere Casino, Hotel & Tower is a Las Vegas Strip resort with an 80,000-square-foot casino. The 1,149-foot Stratosphere Tower is the tallest freestanding observation tower in the United States, featuring the Top of the World restaurant and highest view of the Las Vegas Strip from the Observation Deck as well as SkyJump Las Vegas and thrill rides Big Shot, X-Scream and Insanity. Known as a great value to gamblers, Stratosphere is located close to the Convention Center at the gateway to downtown Las Vegas. It features 2,427 guest rooms and suites, uniquely themed restaurants, the Tower shops, MJ LIVE, the world’s most successful Michael Jackson tribute show, The World’s Greatest Rock Show, Magic vs. Music show and L.A. Comedy Club, featuring the hottest up-and-coming stand-up comics. Stratosphere’s ace | PLAY™ program allows players to enjoy awards, comps and exclusives based on their loyalty to the Stratosphere Casino, Hotel & Tower on the Las Vegas Strip, Aquarius Casino Resort in Laughlin, Nevada, and two Arizona Charlie’s locations in Las Vegas. For more information, visit StratosphereHotel.com, call 702-380-7777 or 800-99-TOWER (998-6937). Golden Entertainment, Inc. owns and operates gaming properties across two divisions – resort and casino operations and distributed gaming. The Company operates approximately 16,000 gaming devices, 114 table games, 5,162 hotel rooms, and provides jobs for more than 7,200 team members. Golden Entertainment owns eight casino resorts – seven in Southern Nevada and one in Maryland. Through its distributed gaming business in Nevada and Montana, Golden Entertainment operates video gaming devices at nearly 1,000 locations and owns nearly 60 traditional taverns in Nevada. The Company is licensed in Illinois to operate video gaming terminals. Golden Entertainment is focused on maximizing the value of its portfolio by leveraging its scale, leadership position and proven management capabilities across its two divisions. For more information, visit http://www.goldenent.com.